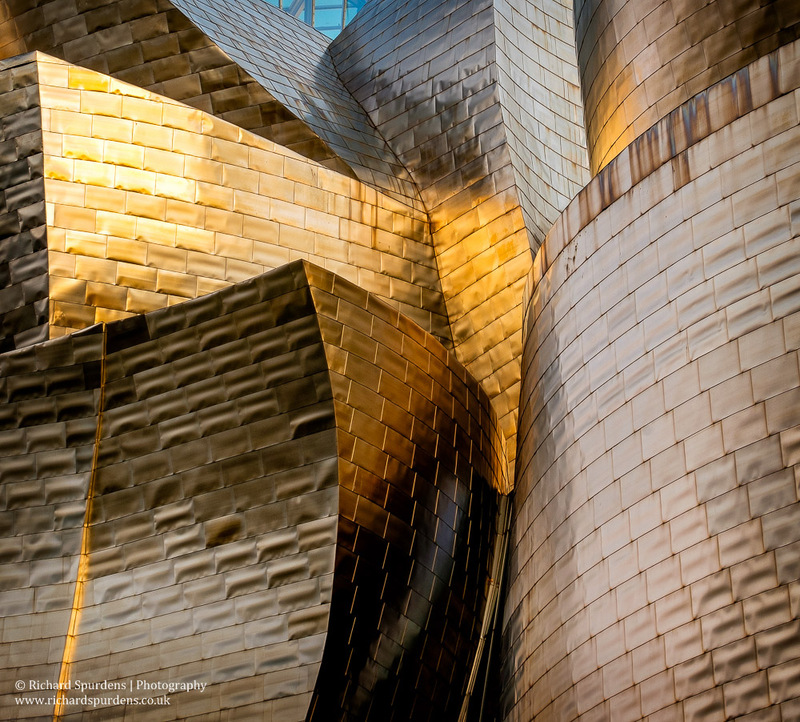 Now I knew that one of the attractions for me in Bilbao was the Guggenheim Museum for its architectural design both on the outside and inside too. But were there other photographic opportunities as well? With a bit of research on the web I found a good photographic blog from Lizzie Shepherd who had been there in December of last year. Her blog showed that there were quite a few other areas to visit that were worth taking a camera along to. With a few days of research on how best to get there by my wife, we decided to go by train. 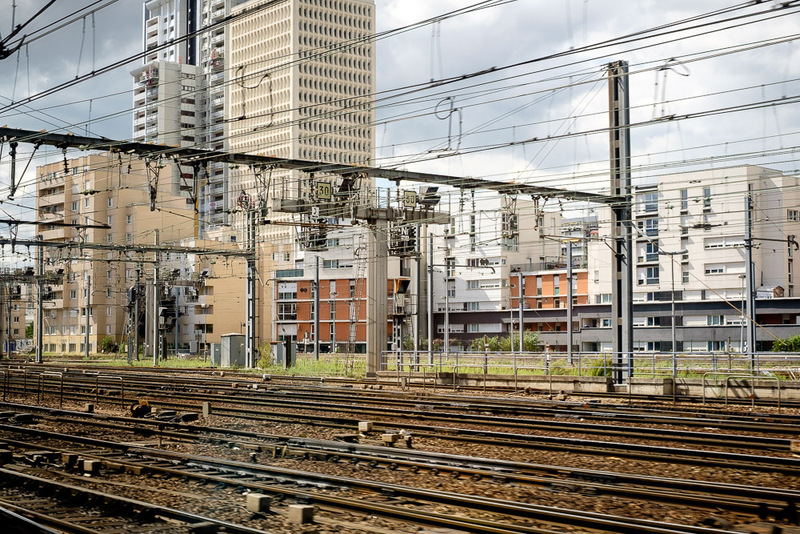 So at the beginning of this month we boarded a train and headed down to London via the East Coast Mainline; then out from St Pancras by Eurostar to Paris; and across Paris by Metro to Paris Montparnasse. Boarding the modern French TVG Atlantique train, we travelled across France to Hendaye and then a short walk to the tram station and on across the Spanish border to Irun. 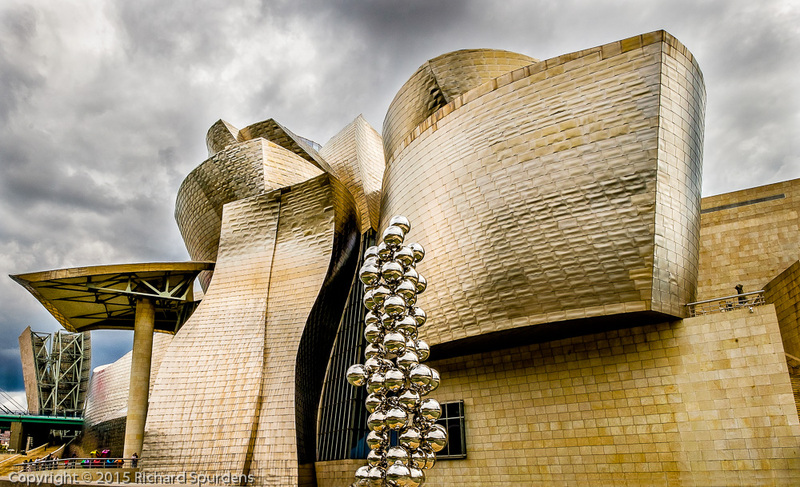 A night in a hotel in Irun was followed by another local train journey to the city of Bilbao. My camera of choice for traveling is now the Fuji system as the XT-1 and the 5 lenses I carry are capable of covering all the images I might want to take. It is also a lot easier on the shoulder when you are out walking all day – that can make a lot of difference. All my Fuji gear fits into a small Bingham shoulder bag so if you are flying it doesn’t give issues getting the bag onto the plane. I had also brought my recent addition to my travel kit the ‘Brian’ – the 3 legged thing, and a range of filters but in the end the only filter I used was the polarizer. 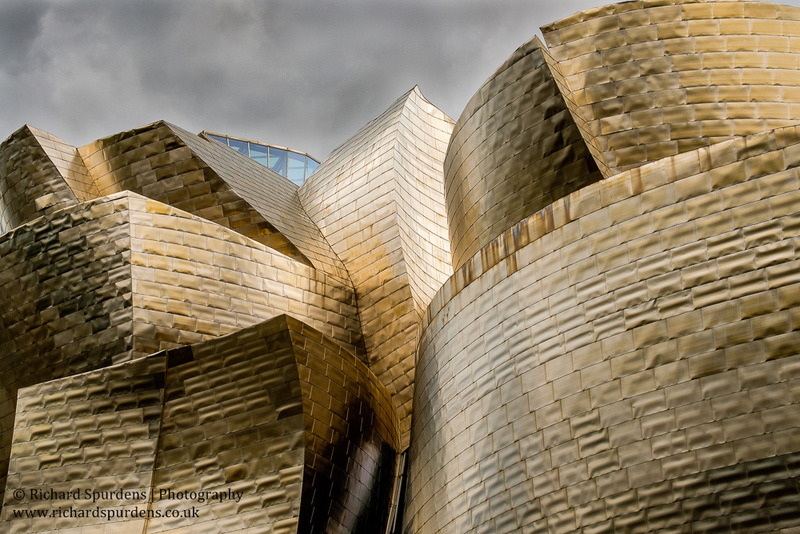 Once we had settled in to the hotel which was situated near the Guggenheim we headed out to explore. Over the next few days I had plenty of opportunity to explore both the exterior and interior of this wonderful building. 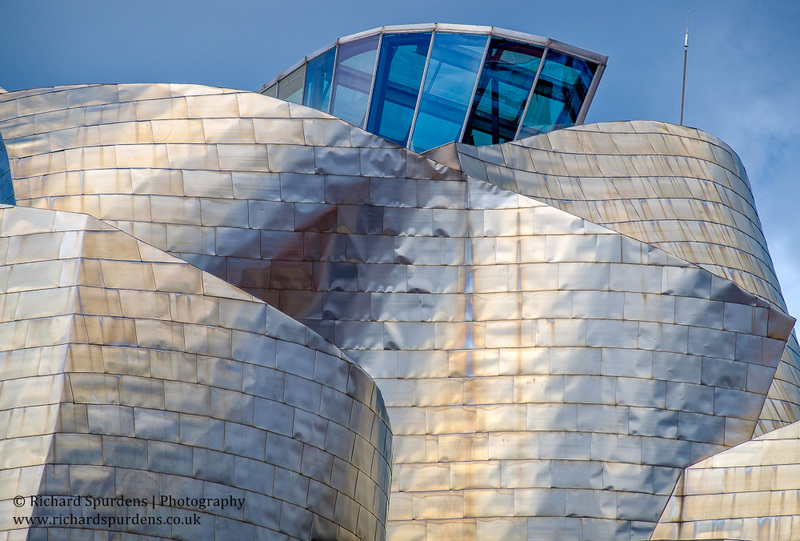 I loved the shapes and flows of the lines and different colours the titanium cladding gave in the different light. I could have spent a lot more time trying to do it justice. I was lucky that on the days we were there was a lot of rain clouds around so the roof structures stood out well against these dark clouds. It would be a lot different against a clear blue sky I would think. 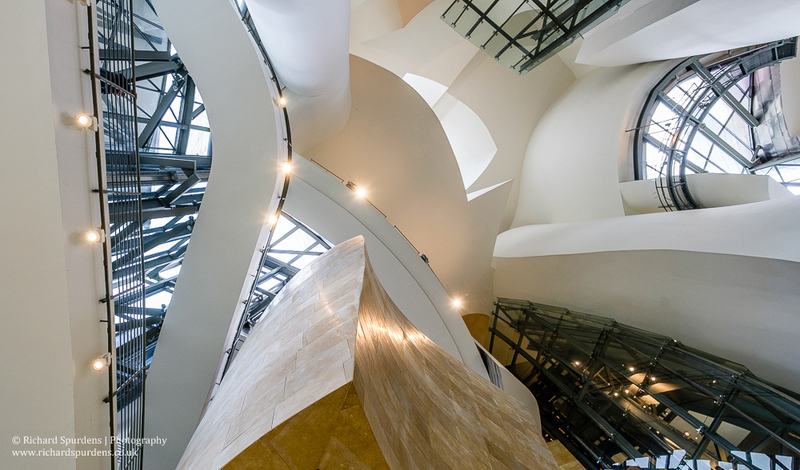 Of course the Guggenheim is not just about the outside and an afternoon was spend inside the wonderful building were you can see the flow of the architect’s design. 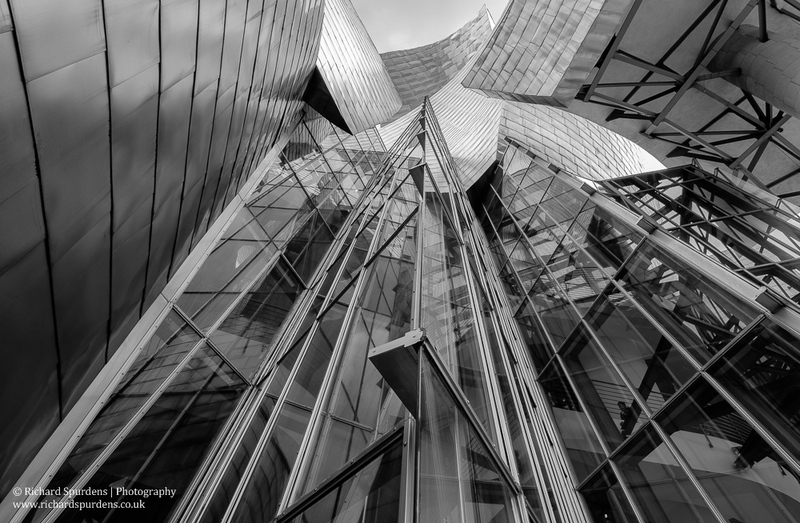 The support structures are described as being like arteries and the building flows from the outside to the inside with the titanium plates continuing into the building and become part of the interior. 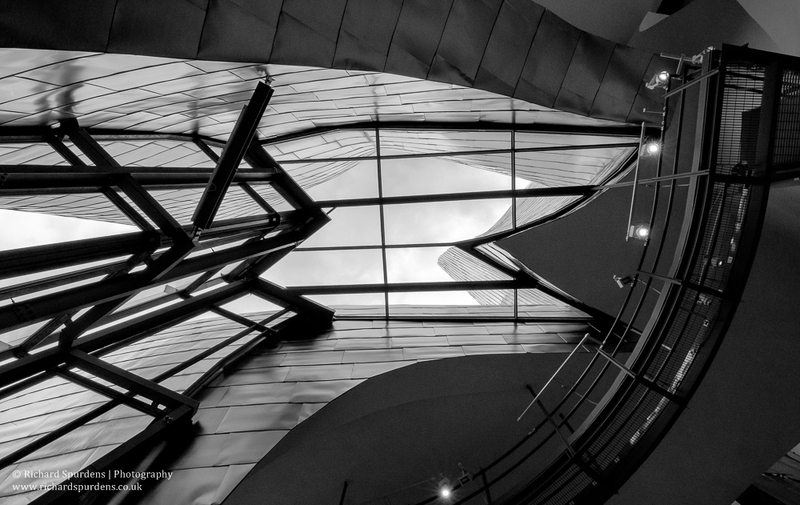 Photography is allowed in some areas of the building but not others, and you are quickly told if it is not allowed. 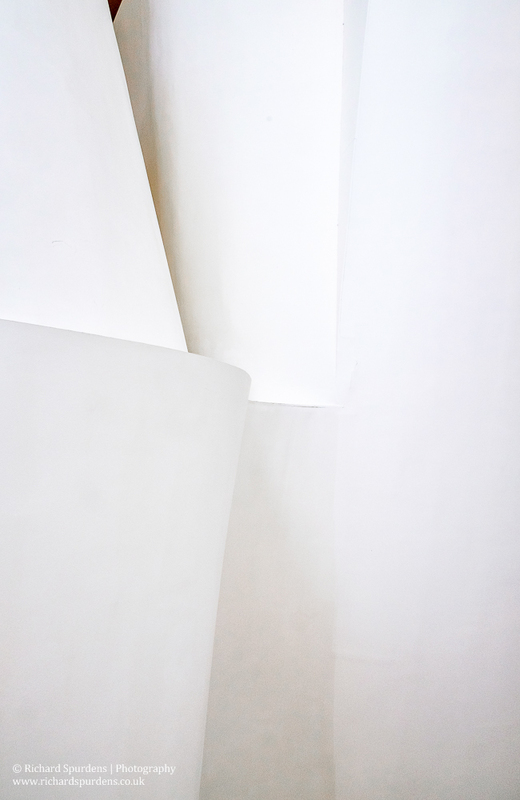 The exhibition by Richard Serra, entitled The Matter of Time, is just amazing to see and experience and you seem to be able to take images among the structures without any issues but not from the viewing gallery above! Another more colourful sculpture in the Guggenheim is actually outside but you can only get to it by going and paying the entry to visit the museum. 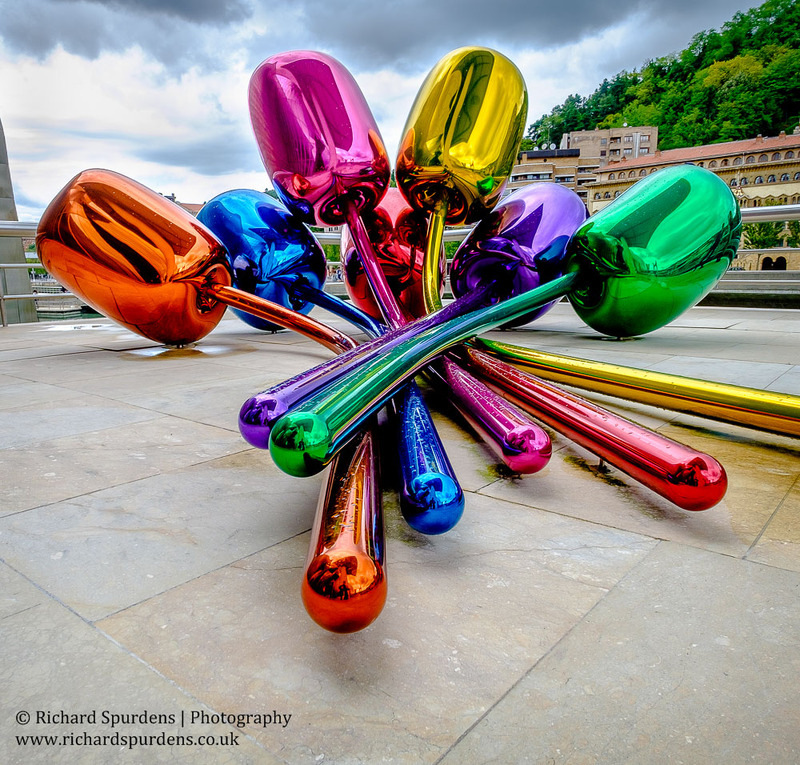 This is a collection of giant tulip bulbs by Jeff Koons, it is certainly photogenic and offers lots of different viewpoints, you just have to wait your moment between other visitors. 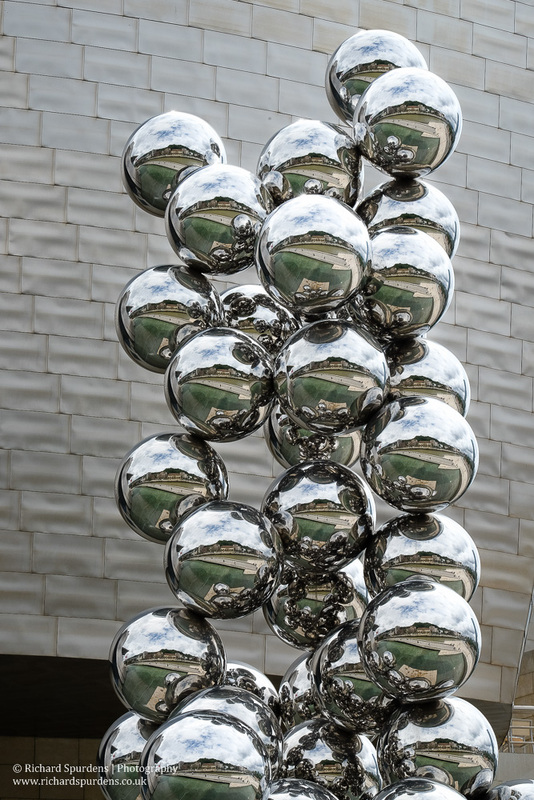 The other big exhibition was a retrospective of the work of Jeff Koons (Artsy’s Jeff Koons) including the controversial, ‘Made in Heaven series’. But I didn’t take any images of this exhibition interesting and colourful as it was; for me the building was the star of this show. 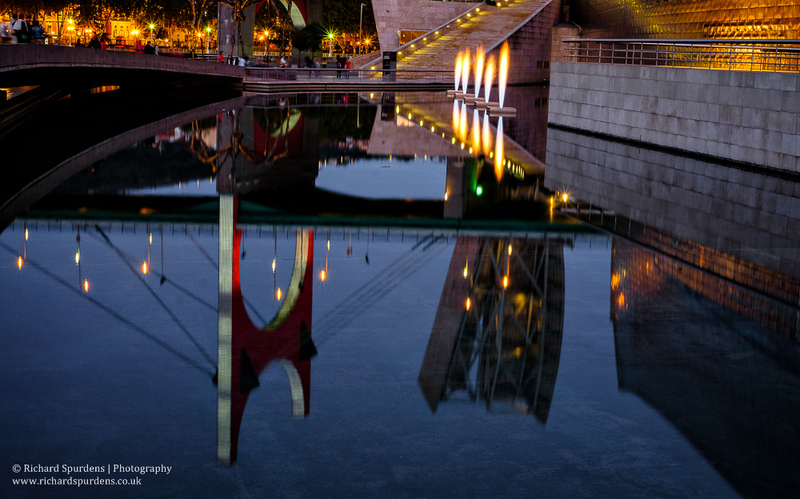 Bilbao also offers some good low-light night photography. 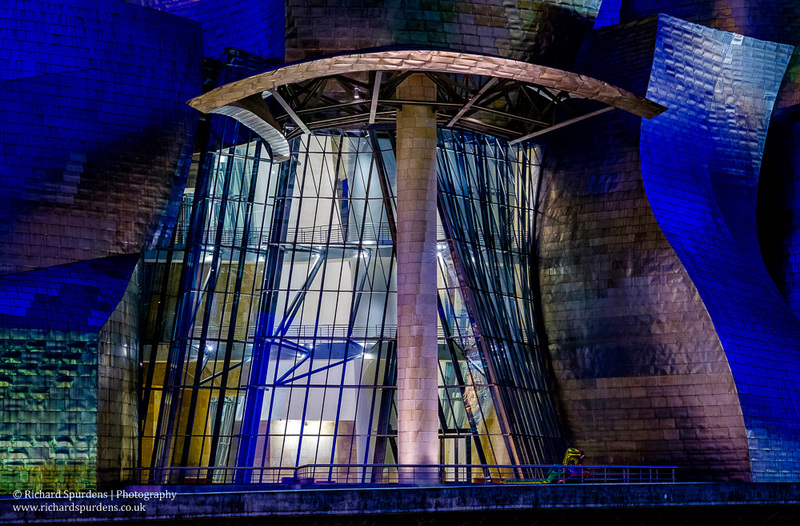 Obviously the Guggenheim is the first port of call for this as the building is well illuminated at night as are the outside sculptures and bridges near the museum. 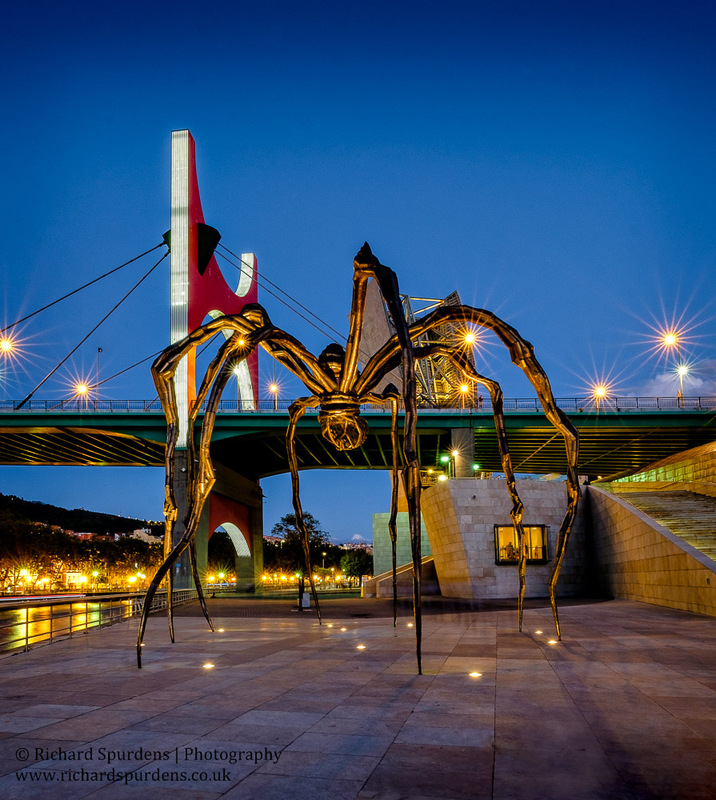 There is a Louise Bourgeois giant spider to try and capture as the night falls and the sculpture and building are lit up. 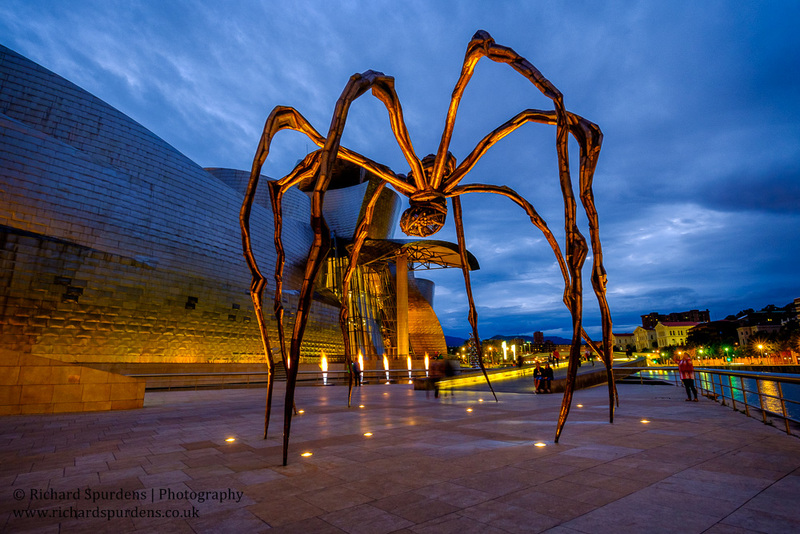 The composition using the spider and building is a bit tricky but I think this one works for me as it also captured the fire fountain (Yves Klein) The fires burn at regular intervals for around 30 seconds so you just need to choose your location and then setup and wait for the roar of the flames. I was hoping the long exposure would take out most of the other visitors but one or two chose to stand for long enough to register.